Police Officer Brian DiBucci was killed after he fell approximately 100 feet from a highway overpass during a foot chase of a suspect. Other officers were initially involved in a vehicle pursuit of a stolen car, but the suspect vehicle crashed at the end of the overpass and the suspect fled on foot. Officer DiBucci was acting as backup and was approaching the scene as the other officers were taking the suspect into custody. Other officers noticed he had fallen when they spotted his car on an adjoining overpass and radioed to him. After Officer DiBucci did not return the radio calls, other officers went to investigate and determined he had fallen. 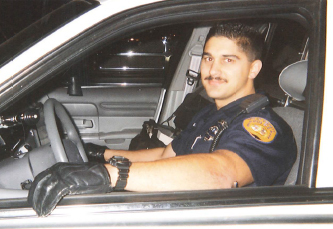 Officer DiBucci had served with the Everett Police Department for 1-1/2 years and had served in law enforcement for a total of four years. He his survived by his fiancée. Interesting how 19 years can pass by and it still feels as if it was yesterday. Today is a day of connecting with friends and family who loved you and who will never ever forget you. It's also a day of taking the time to share our memories of our beloved Brian, and they are many. I always find myself hoping for that one story I haven't heard before. As bittersweet as it may be, they are priceless. You may be hanging out with your dad these days. I know that's a big "maybe" but I definitely hope that's the case. He loved you dearly and was extremely proud, as we all are. The love in my heart explodes each and every day for you and I absolutely feel it back . It's the one thing I know I can always count on.